Edmund Hlawka is the most famous living Austrian mathematician and a prominent university teacher in Vienna. He contributed important theorems to the geometry of numbers, to the theory of uniform distribution, and to numerical integration. 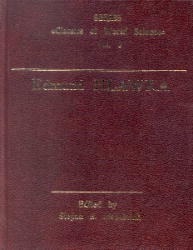 In this book, the editor attempts to summarize Hlawka´s results from 1935 to his 85th birthday in 2001. The book can also be considered as an introduction to a comprehensive review which still seems to be missing, on the history of Austrian mathematics in the XXth century.